Apple's big event matched exactly what had leaked and what we said to expect. Apple has introduced the iPhone X, the iPhone 8 and iPhone 8 Plus, as well as a cellular-equipped Apple Watch and an updated Apple TV. High-end iPhone X model with edge-to-edge screen and dual cameras and Face ID facial recognition. It starts at $999, with orders beginning Oct. 27 and shipping Nov. 3.
iPhone 8 and iPhone 8 Plus with faster chip, improved camera and speakers and a new glass front and back casing for wireless charging. The iPhone 8 starts at $699 and will be available to order Sept. 15 and in stores on Sept. 22. Retail chief Angela Ahrendts showed how Apple is redesigning its biggest stores into "town squares" with open spaces. Among the new spots are redesigned stores in Paris, New York, Washington D.C. and a new store on Chicago's Michigan Avenue. The event kicked off with CEO Tim Cook delivering a tribute to Steve Jobs, details on the company's hurricane relief efforts as well as an overview of the new Apple headquarters. Apple Watch: Series 3, the new Apple Watch, will have a built-in cellular connection and shares a number with the iPhone. "This has been our vision from the very beginning." COO Jeff Williams said. A built in cellular connection will let users take calls, stream Apple Music or access Siri without relying on a nearby cell phone. It has a new dual-core processor, a homegrown Wi-Fi/Bluetooth chip and an altimeter, while keeping the size of the watch roughly the same as the prior model and promises "all-day" battery life of up to 8 hours. A cellular version will sell for $399, with a Wi-Fi only version at $329. The original Series 1 will remain in the line at $249. More on the Watch: Apple says it is now the No. 1 watch in the world and has 50 percent year-over-year growth, but still hasn't given specific sales figures. Apple is also updating its software to offer more detailed heart rate information, including notifying people when they have abnormally high resting heart beat and tracking irregular heartbeats as part of a new nationwide study in conjunction with Stanford's hospital. Watch OS 4 will be available Sept. 19. Apple TV 4K: The new set-top box, which includes support for higher resolution 4K images and HDR (High Dynamic Range) and will be available Sept. 22 (pre-orders start Sept. 15). The base model will sell for $179, with a model with more memory priced at $199. 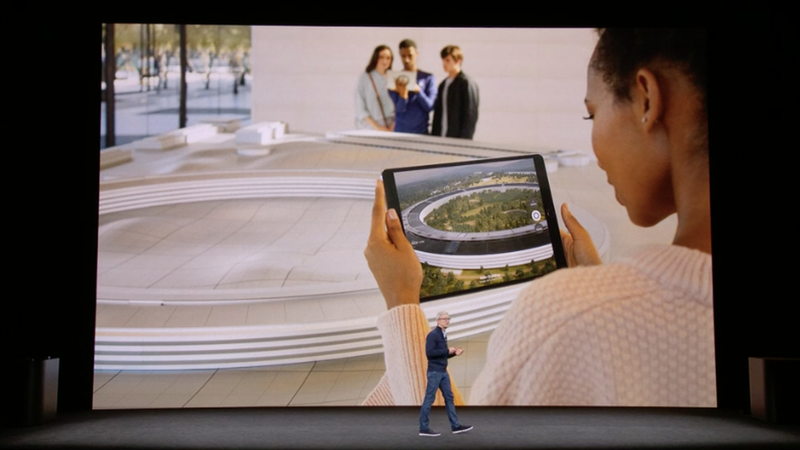 It's powered by the same A10X chip in the company's iPad Pro tablet. Apple says 4K movies on iTunes won't cost more than the HD versions, and that if you have purchased an HD movie before, it will be updated to 4K for free. Live news and sports are being added to the main Apple TV interface, including alerts for close games. iPhone 8: Apple introduces iPhone 8 and iPhone 8 Plus, which are similar to the iPhone 7 but add improved speakers, a new glass front and back and a new six-core processor, which Apple calls the A11 bionic. It also supports wireless charging (a feature Apple once dismissed as not a big benefit). The phones will be available in 64GB and 256GB varieties and be available to order Sept. 15 and start shipping Sept. 22. The iOS 11 update for existing phones will be released Sept. 19. "This is a huge step forward for iPhone," Cook said. Of note, only the larger iPhone 8 Plus has the dual cameras. That's the same as with the iPhone 7, but there had been hope that Apple might bring the dual camera to the iPhone 8 as well. Apple is expanding the portrait mode on the iPhone 8 Plus to offer new lighting features. The iPhone 8 also has new sensors and cameras designed to be used with augmented reality. iPhone X: The high-end model features an edge-to-edge screen and what Apple calls a 5.8-inch "super-retina" display using OLED, rather than the LCDs used in past iPhones. As expected, there is no home button, with gestures replacing the functions previously handled by the home button. There are a number of improvements to the camera, including the fact that the iPhone X's front-facing camera supports portrait-mode selfies. Apple says it has two hours more battery life than the iPhone 7. As we reported, the phone will go on sale more than a month after the iPhone 8 and may well still be in short supply. It will start at $999 for a 64GB model. Pre-orders start Oct. 27 with general availability Nov. 3. Face ID, the Apple facial recognition technology we wrote about previously, replaces Touch ID fingerprint recognition to unlock the device. A built in neural processing engine on the A11 bionic chip allows Apple to do the face recognition on the device. Apple is also using the facial recognition for "animoji" - emoji that can match your facial expression. Unlike rival technologies, it won't be spoofed by a photo, thwarted by glasses and can adjust to newly grown facial hair. Like the iPhone 8, the iPhone X supports wireless charging. Speaking of wireless charging: Apple showed a sneak peek at a charging pad that can simultaneously charge a new iPhone, an Apple Watch and AirPods (with a new wireless case). Apple calls it AirPower and says it should be coming next year.